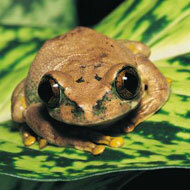 has led to the decline of at least 501 amphibian species in the past 50 years. Scientists are calling for improved biosecurity and wildlife trade regulation to further prevent mass amphibian extinctions. The call comes after a study published in Science found the fungal disease chytridiomycosis has caused death and species extinction on a global scale. Chytridiomycosis eats away at the skin of amphibians and is present in more than 60 countries. The worst affected parts of the world are Australia, Central America and South America. In the study, researchers show how the disease has led to the decline of at least 501 amphibian species in the past 50 years, including 90 presumed extinctions. In Australia, researchers found that the disease has led to the decline of more than 40 frog species in the past 30 years, of which seven species had become extinct. Lead researcher of the study Dr Ben Scheele said that globalisation and the wildlife trade are the main causes of the pandemic and were allowing its spread to continue. "Humans are moving plants and animals around the world at an increasingly rapid rate, introducing pathogens into new areas,” he said. "We've got to do everything possible to stop future pandemics, by having better control over wildlife trade around the world." Dr Scheele added that many species are still at high risk of extinction over the next 10-20 years from chytridiomycosis due to ongoing declines. "Knowing what species are at risk can help target future research to develop conservation actions to prevent extinctions."